Fall is in the air! We have been gearing up for the upcoming Fall season around our house with a little decorating. I have walked past the plain glass block display in the craft store countless times and never knew quite what to do with them. After a trip to the craft store last week, I started to look around - and I found some great concepts for Fall Glass blocks. So, I decided to give them a try this past weekend. We made a pumpkin (jack-o-lantern) , Scarecrow and a Mummy. All are super simple to make, require only a few supplies and cost $10 and under (each) to make! 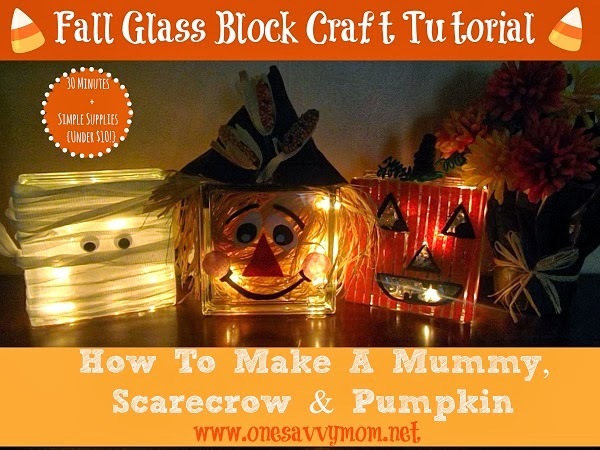 Read on for supply lists and tutorials for the Scarecrow, mummy, and pumpkin glass blocks. Remove the lid from the glass black (always position this on the bottom) - stuff the glass black with Raffia. Next add in the strand of white lights (position behind the raffia) - leave the plug hang out of the bottom - position the lid back in place (with the plug still hanging out of the back). Using the white sticky back felt - cut two large ovals (about 2 inches) and two small white circles (about 1/2 inch) for the eyes. Using the black sticky back felt cut two black circles (about 1 inch), smile and two eyebrows. Using the red sticky back felt cut 1 red triangle (about 2 1/2 inches) for the nose. 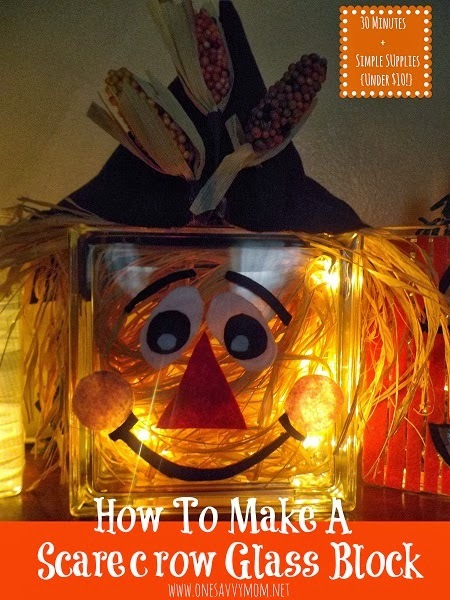 Assemble your Scarecrows face on the front of the glass block as pictured above. Simply peel the back off the sticky back felt and affix to the glass block. gather a raffia (about 18 inches) in the center - tie off with string or pipe cleaner. Affix to the top of the glass block using heavy glue or low temp hot glue to create your Scarecrows hair (see above image). Using the brown felt (8x10), fold over (with felt positioned horizontally) and create a cone to create the Scarecrows hat - glue along the fold using heavy glue or low temp hot glue. Affix the hat to the top of the glass block over the raffia "hair" - securing with heavy glue or low temp hot glue around the top edges of the glass block. Optional: Add Cornstalk decorative element to the front of the Scarecrows hat using low temp hot glue or heavy glue. Remove the lid on the glass block (position the opening at the bottom) add in the strand of white lights - leaving the plug hang out of the back - replace the lid back over the opening. Wrap the gauze all the way around the glass block from the bottom to the top (securing it every few inches with heavy glue / low temp hot glue). 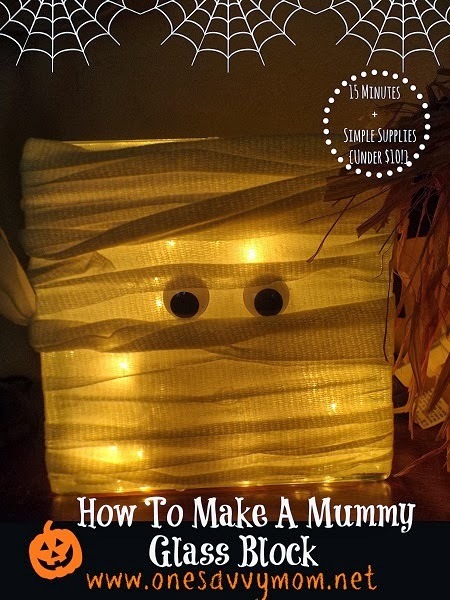 Note: Make sure to twist the gauze occasionally to add a little bit of character to your mummy. We also tied a knot in the gauze on the side and left a piece of gauze hang loosely (see above image). Remove the lid on the glass block (position the opening at the bottom) add in the strand of white lights - add in a roll of cut and curled black or silver ribbon as filler around the lights. Leave the plug hang out of the back - replace the lid back over the opening. Using the orange sticky back felt create a cutouts to resemble a jack-o-latern (see above picture). Peel the backing off the sticky back felt and affix to the front of the glass block. Using the second sheet of orange sticky back felt create cutouts for the back of your pumpkin (glass block). Peel the backing off the sticky back felt and affix to the back of the glass block. Using the black sticky back felt create outlines for the eyes, nose and mouth of your jack-o-lantern (see picture above). 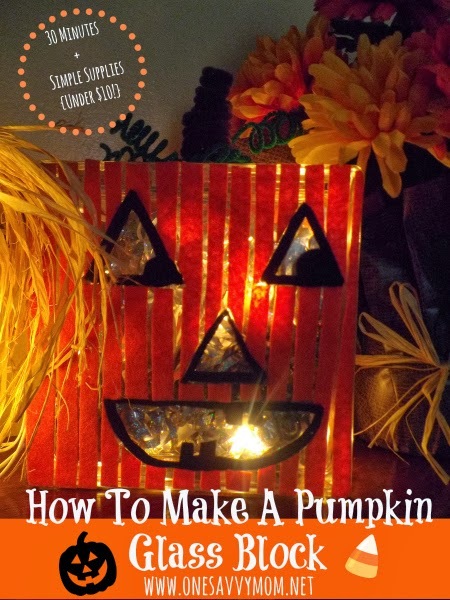 Peel the backing off the sticky back felt and affix to the glass block to outline the features of your jack-o-lantern. Create a stem for your pumpkin by curing the brown pipe cleaners (see above picture). Create vines for your pumpkin with the green pipe cleaners. Affix the stem and vines to the top of the glass block with low temp hot glue or heavy glue. Now simply plug in your new creations - the Scarecrow, Mummy and Pumpkin create an adorable glow that the kids will love!